Aged-care advocate: BallyCara chief executive officer Marcus Riley says he hopes to provide input into the royal commission that could reshape aged-care culture for the better. LEADING advocates for Australia’s ageing population have urged that the Royal Commission into aged care should have powers to examine beyond shocking cases of abuse and neglect highlighted in recent media reports. 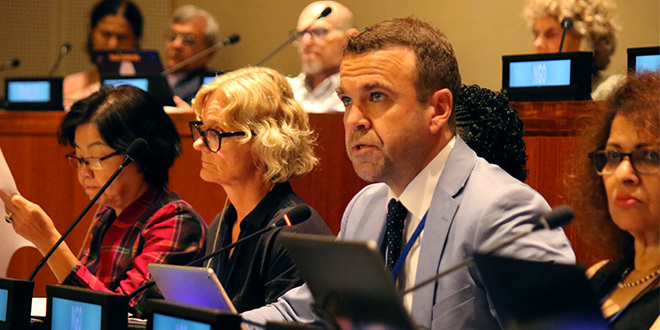 The Brisbane-based chairman of the Global Ageing Network (GAN) Marcus Riley said a royal commission should broaden its scope to examine connected issues in social policy, the legal and judicial system, and the economic impacts of pensions, health funds and primary health networks. “Aged care is a team sport. We need to have that sort of approach,” Mr Riley said. As well as serving as chairman of the GAN, representing 24,000 organisations in 52 countries, Mr Riley is chief executive officer of BallyCara that provides retirement living, residential aged care and community care in south-east Queensland. He has decades of first-hand experience understanding the needs of aged residents but, like most Australians, was alarmed to see hidden-camera footage shown recently on the ABC’s Four Corners program that revealed shocking abuse and neglect in nursing homes. “Absolutely. You can only imagine the horror that those individuals and their families would have experienced through the circumstances they were put in,” Mr Riley said. “Over the years you become aware that there are some poor practices at different times, but the extent of those individual practices was absolutely alarming. The royal commission, which could start as early as November, has been called to look at the quality of care within the aged-care sector, the extent of any substandard care, young people with disability living in aged-care homes, how the system is meeting the needs of people with dementia (who make up about half of all aged-care residents), and to consider the sector’s future needs. National Seniors Australia (NSA) chief advocate Ian Henschke believes the royal commission must address challenges of supporting the increasing number of Australians suffering dementia, and the mounting costs of residential aged care. “I think it is going to have to delve deep into some of the issues around finances, particularly where the money is going at the moment, because we are spending as a nation almost $20 billion a year on aged care,” Mr Henschke told Radio 6PR in Perth. New NSA research has revealed many older Australians lacked the knowledge, skill and motivation to access aged-care services, including where to lodge complaints. It showed 60 per cent of older Australians have never heard of the Aged Care Complaints Commissioner, and 65 per cent feel there are no options to complain. The research also revealed 70 per cent had never looked at the My Aged Care website, while 85 per cent had never phoned the government service, which aims to make it easier for older people, their families and carers to access information on ageing and aged care. Mr Henscke said the research clearly showed older Australians needed to become more literate in aged-care matters. “And people who work in aged care are fearful of speaking out,” he said. “So that is one of the great things about having a royal commission, because when you go to a royal commission you have the protection of that commission. Mr Riley said he hoped to provide input into the royal commission that could reshape aged-care culture for the better. “It’s very difficult to prevent a first incident by a staff member who might be inclined to be so abusive,” he said. “We need a culture within our aged-care facilities which instantly calls out those sorts of behaviours. Mr Riley said a “cookie cutter” approach to providing aged care was simply not good enough in Australia. He advocates a personalised approach for the wellbeing of each aged-care resident. “We need to have a mentality of not just good care but restorative health,” he said. “As an industry and as an aged-care system we need to be ensuring that aged care is a given. Mr Riley also believes investment in recruiting and retention of the right staff is critical to stamping out abuse. “One of the important things for a provider is to be really investing in the recruitment process so that you are spending time with individuals before they hit the floor working in any facility – to give you the best chance of ensuring they are the right person for the sorts of roles,” he said.